What's Wrong with Canada Post? Everybody has a post office horror story. It may be delayed or lost mail, damaged mail, service cutbacks, surly posties, strikes... Any company sprawled over the biggest postal service area in the world -- even bigger than Russia's -- with 71,000 employees, and post offices and retail outlets in just about every community, is bound to mess up from time to time. These stories could fill hundreds of pages. (Here are just a few: here and here). But this website is not about all that. This is about Canada Post's traditional role as the glue for business in this country: how it has enabled thousands of businesses, small and large, to sell products and services, to ship products, to send and receive payments -- and how this role is eroding. This is about documenting the malignant policies and practices of Canada Post that are hurting Canadian businesses and killing off the culture of mailorder in Canada. With the rise of the Internet as a cheap and effective medium for sales, Canadian mailorder businesses should be riding a wave of prosperity; but instead opportunities are squandered and the mailorder business model is gasping for air. Is it any wonder that revenue is flat and profits are dropping and in danger of falling back into the red the company was mired in for years? This is about documenting the malignant policies and practices of Canada Post that are ... killing off the culture of mailorder in Canada. We will not succumb to simply blaming everything on the unions. For sure, the unions have contributed their fair share -- and maybe more -- to the problems of the post office. Few will doubt that with the pay, the benefits, the hours of work, and the pensions, there are thousands of Canadians who would gladly trade places with postal workers. But the union problem is a management problem and we believe the long history of dysfunction could have been avoided by the top leaders. We also will not take aim at the character of the workers, supervisors, and managers of Canada Post. We believe that most employees are well-meaning and want Canada Post to succeed as a business and as a conduit for business in Canada. Every organization has its bad apples and we will not lay all blame on them for Canada Post's failures. While calls for the privitization of Canada Post are often in the air (e.g. here), we believe privitization will not necessarily solve Canada Post's problems. We will therefore not take a stand for or against it. But we do think a shake up is needed. Canada Post is a top-down organization that is not listening to customers, partners or employees. Others are saying much the same thing (see here, here and here). Canada Post's leaders placed all bets on its biggest customers, and some of those bets have gone sour, putting the business at risk. Meanwhile the leaders have ignored the needs of small business customers. 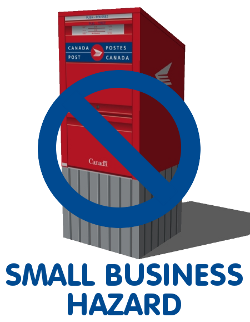 Small businesses become big businesses one day, but if Canada Post is not providing the support small businesses need then they can't grow. We call on Canada Post's leaders to put themselves in the shoes of small business owners and see for themselves just how hard it is to grow a mailorder business in Canada. This website is designed to highlight the policies and practices that negatively affect the wellbeing of mailorder business in Canada. Do you have examples that show how Canada Post hurts small businesses? Have you been ignored or given the roundaround? Do you have ideas how Canada Post can make your business more competitive? Let us know!